The Applied Policy Research Unit (APRU) is an arm of the Centre for Rural Health Research focused on producing and synthesizing policy relevant research to inform rural health service planning in a timely, user-friendly way. Here you can find details of our work, including downloadable PDFs of each of our reports, shorter policy briefs, and other relevant material. An examination of international literature related to the safety of primary maternity services without surgical capacity for rural BC. This broad-ranging review is the first ever to connect competing fields of research that have influenced our understanding of the safety of small volume, low-resource primary maternity units without local surgical capacity. Examining international literature from Canada, Australia, the United States, Norway, New Zealand, Finland, Sweden, Wales, Scotland, England, France, the Netherlands, Denmark, Iceland and Germany, this review finds that greater distance to maternity services is a serious threat to rural and remote women and their babies. Inside this review, you will find a comprehensive consolidation of research evidence on rural health disadvantage, the safety of primary maternity services, distance to care, the impact of service volume on maternal-child outcomes, sustainability of services and psycho-social risk/safety. An applied examination of enabling factors in returning birth services to rural and remote First Nations communities in BC. Prepared for the First Nations Health Authority, the Applied Policy Research Unit examined international evidence for and experiences of returning birth to small, rural and remote Indigenous communities. A series of enablers (or levers) in the health services system were explored to develop a concrete awareness of how to build and support culturally resonant, safe and sustainable small birth and birth support services. APRU and FNHA agreed to privilege data specific to Indigenous models of care in which cultural and social safety were components of care, and to examine successful and relevant case studies for applicable learning. Over 160 sources were considered across eleven enablers in four models of care. 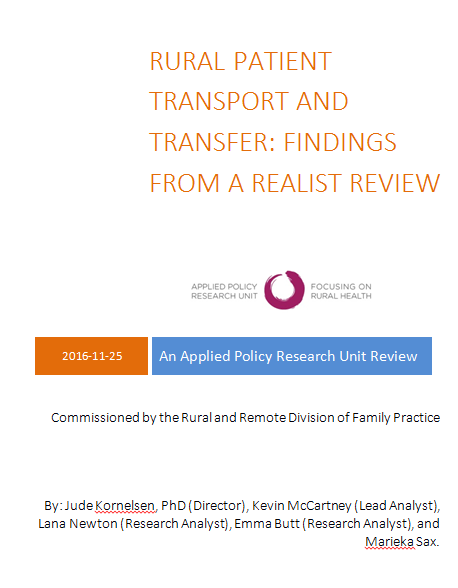 This short, 4-page document gives a strong overview of the context, importance, and findings of the report, System Enablers of Distributed Maternity Care for Aboriginal Communities in British Columbia: Findings from a Realist Review (found above). The reference list can also be found in the full report. An in-depth evidence review and report by the Applied Policy Research Unit on the organization of perinatal surgical services in BC. This review was commissioned by Perinatal Services of British Columbia and the Ministry of Health. Balancing the international scope of the evidence reviewed with the need for local applicability to the BC health services context, the APRU team used a realist review methodology. Over 190 sources were reviewed from key topics related to rural surgical care, including: the safety and efficacy of surgical models; sustainability of service; satisfaction for all stakeholders; cost; and cost-effectiveness of models of care with differing levels of centralization. This short, 4-page document gives a strong overview of the context, importance, and findings of the report, Optimal Perinatal Surgical Services for Rural Women: A Realist Review (found above). The reference list can also be found in the full report.